ANS 40:4 just released; new featured topics announced! The latest issue of ANS has just been released, bringing to a close the end of our 40th anniversary year! See the Table of Contents here and watch for each article to be featured over the next 3 months! Featured articles are available for download at no cost on the ANS website while they are featured, and we post a message about each article and the authors on this blog! Manuscripts generally relevant to the purposes of the journal are welcome at any time. The purposes of ANS are to advance the development of nursing knowledge and to promote the integration of nursing philosophies, theories and research with practice. We expect high scholarly merit and encourage innovative, cutting edge ideas that challenge prior assumptions and that present new, intellectually challenging perspectives. We seek works that speak to global sustainability and that take an intersectional approach, recognizing class, color, sexual and gender identity, and other dimensions of human experience related to health. 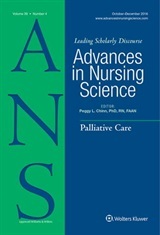 Since the publication of the Newman, Sime and Corcoran-Perry article titled “The Focus on the Discipline of Nursing” in ANS in September, 1991, there has been growing discussion to clarify, amplify and explore not only the definition, but the implications of various interpretations of the focus of the discipline. Over these decades advances in other disciplines and the growing demand for interdisciplinary cooperation have influenced the discussion of nursing’s focus and where it fits int he interdisciplinary context. For this issue of ANS, we seek articles that advance these discussions. We welcome articles that reflect empirical or philosophic methodologies. Articles must address the development of nursing knowledge that informs nursing practice, education and research. In the past decade, issues of discrimination based on culture and race have risen to the surface in many countries worldwide, along with a growing nationalist movement that rejects “the other.” In this issue of ANS we seek manuscripts that address these factors as they influence health and well-being of individuals, groups and communities, and the delivery of nursing and heatlhcare in culturally diverse communities. Articles must address the development of nursing knowledge that informs nursing practice, education and research.